LumberJocks Woodworking Tip of the Day! 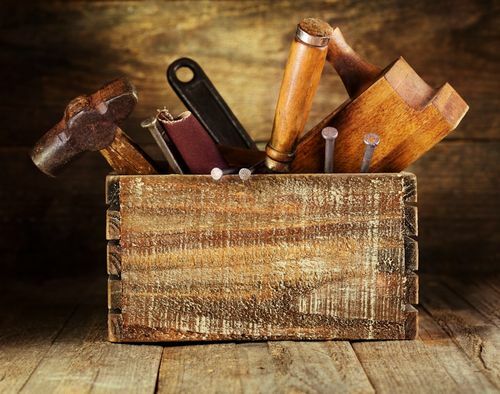 What tips have you learned in your woodworking experience that you wish you knew earlier? Let’s learn from each other and share our tips! To keep this thread going come back each day to share a tip and read the latest posts. Cut grooves in two passes, flipping the workpiece between passes to center the groove. Such a simple idea, but it greatly improves accuracy on this common milling operation. Tip 1 for me would have been to learn to ask for “help” along time ago. How to do something without having the best or most correct tools for the process. So my tip would be for us to just ask when we are not sure. I have seen many LJ’s doing this on here and its great! New tools aren’t sharp (saw blades are excepted). Learn to sharpen. Makes your work much more pleasant. To set depth on the cut of your table saw or router, use a piece of scrap wood and make a mark on it at the desired height. Then set that piece on the table and raise the blade or bit up to that mark. Do not use varnish or lacquer or paint over cedar. Use clear, semi transparent or opaque stain. The oils in cedar will shed varnish and many paint coatings- they will peel right off in time. I don’t care how many tape measure you have in the shop, or even how “good” they may be. When you start a project, use ONE, and only one. Tape measure are usually close to each other…..NOT! Half the time: it is that wee hook out on the end of the tape that gets beat up. Bends a bit, and measurements change with it. Then, if you would change to another tape…...measurements will be different. What MIGHT be a 15-3/4” long piece with one tape, might be off by 1/16” on another tape. Pick one tape measure for a project, use it through out the project. After that, use it again if you like it, if not..throw it out. Note: If you also use the markings on that combo square, at least check to see if they match the tape measure you are using. When planing rough lumber, switch sides repeatedly to get the straightest flattest boards. Measure twice, cut once. You can cut a little more off, but just can’t add it back on. I’ve learned to always cut long. I can always cut again if it’s too long but it’s harder to glue the pieces together if I cut the wood short. I always measure twice, in two different spots, then will connects the dots with a square ( if permissible). I prefer to CYA, it might a little bit too much but I don’t have thousands of board feet sitting around so I cherish what I have. When using machinery, think about what you’re doing….. not about what you’re going to do. Safety does not take extra time it takes extra focus! Listen to the voice in the back of your head… unless it says hold my beer & watch this! Seriously, don’t leave any fingers in the shop! NO operation is too small to use a push stick with power tools! Keep you fingers out of anything with a blade. Don’t skimp on things that spin at 8000 rpms your fingers nether regions and body will thank you.